Wild Camping at Meon Springs is in fully-equipped Bell Tents. It is an exclusive and supported camping experience deep in the Hampshire Woods. 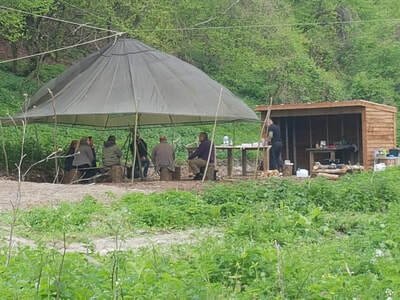 Wild Camping at Meon Springs is suitable for groups of friends, families and, being an exclusive site, it is also suitable for groups such as well-behaved stag dos and hen dos. Imagine living at one with nature and learning to survive using ancient skills passed down from one generation to another. Well, that’s a great way to describe a wild camping experience here at Meon Springs. The experience – which can be taken over two or three nights – combines wild camping in bell tents with the support of hosts and experts to help you enjoy your woodland experience. We'll support you as much - or as little - as you want. For example, we can leave you alone to enjoy the tranquillity of this amazingly quiet spot or teach you all the things you’ll need to survive outdoors – from making fires and cooking on a open flame – to making tools out of wood you find lying around your camp. Most importantly, you'll have exclusive use of the site for you and your group. Sited in a wood in the South Downs, you’ll be off-grid and with no wi-fi either. But the experience of living outside and sleeping in bell tents will be one to remember. Our wild camping experience is about getting away from the modern world and experiencing a different pace of life. It's perfect for extended families or groups of friends looking for an altogether difference experience. 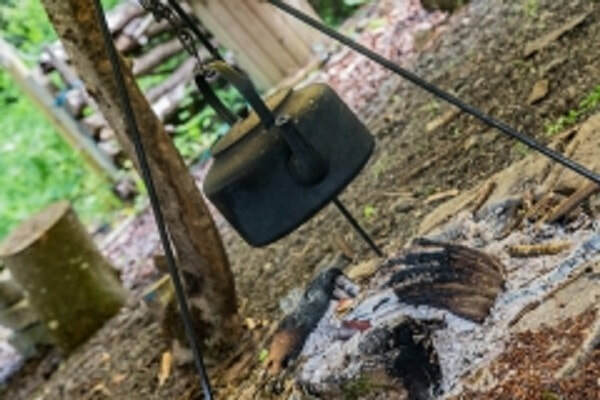 The experience is fully catered and you are provided with all cooking utensils, kettles and wood for the fire. There are natural ovens, tables, stools and places to prepare food. The site has water, showers and there are compost loos as well. We did say it was wild camping. Arrive any time after 3pm to the Meon Springs office. Head off to the woods, with your guide to get you settled in and cooking for your evening meal. Rise when ready to a fully prepared breakfast. Prepare for the days activities or just chill out in the wild. Further activities in the afternoon, if you desire. Sit round the campfire with a couple of drinks. A day to yourself to enjoy as you wish. 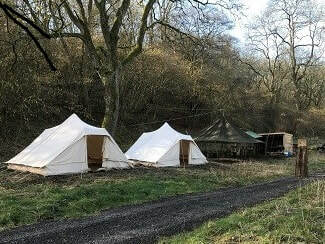 Comfortable Bell Tents, sleeping up to six in each. 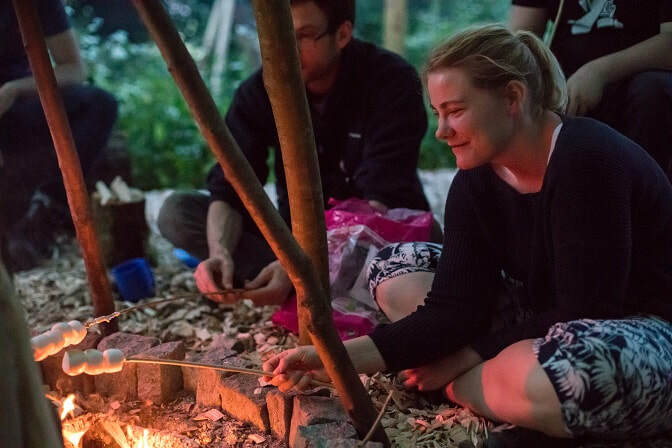 An incredibly powerful Bushcraft Experience, where you will learn skills way beyond just lighting fires. Cooking on open fires and eating in the wild. Loos with a view and hot showers. Everything provided - from bedding to torches. Ideal for families, groups and corporates. For a wild and unique experience. 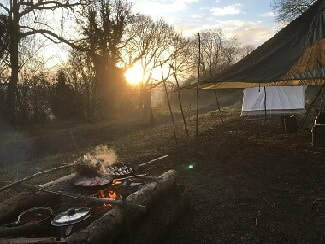 ​Wild Camping at Meon Springs is for those looking for a taste of life outdoors laced with a little adventure. For some, wild camping in the UK is about hunkering down in a field or wood, surviving the elements either in a tent or sleeping bag and eating a tin of beans heated on a gas stove. For others, it's about making the most of what nature has to offer, building a shelter from sticks, bracken and whatever else is to hand and eating food that they've foraged. At Meon Springs, Wild Camping is a more luxurious experience. It combines all the ingredients of outdoor living yet retains the comforts of indoor life. To put it another way, you get the wild camping experience, without the hassle of putting up and taking down a tent, finding your food and learning how to survive without any support. As mentioned above, at Meon Springs, we have our own take on wild camping. And it's not about pitching a tent on a patch of grass or slinging a hammock between two trees and spending the night outside. It's much more than that. It's an experience that will provide you with the tools and skills to live outdoors. What's more, our wild camping experience can be tailored for those who are more than happy to bed down in a bivvy bag - and for those who have never slept in a tent before. There are two things that make the wild camping experience at Meon Springs in Hampshire unique. It's probably more wild glamping than wild camping. First, is the location. It's set in a wooded hangar in the South Downs with a purpose-built centre with food preparation area, compost loo, solar-heated showers and bell tents. The views through the trees overlooking the Meon Valley are simply breath-taking. 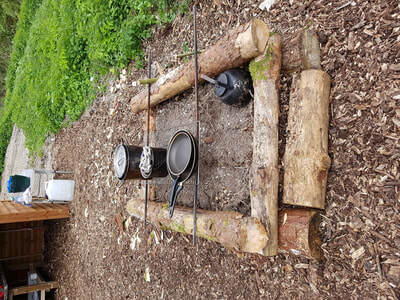 The hangar also provides all that's needed to survive a wild camping experience - wood for a fire or an oven pit - as well as plants for foraging. ​The second thing that sets the wild glamping at Meon Springs is that it's all done under the expert eye of our bushcraft instructors. 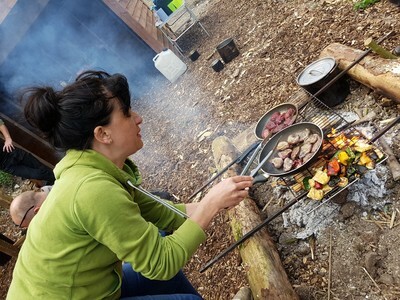 Our wild camping experience isn't just about sleeping outside and sitting around a fire. It's much more elemental than that. Instead, you'll learn how to make fire using sparks - not a match or lighter - from a fire stick. You'll gather all the wood you need and other material necessary to start and maintain a fire. You'll learn about foraging and what plants and berries are safe to eat. Armed with this knowledge you'll cook your own meals with ingredients sourced by your instructor. Depending on dietary requirements, that could involve making a simple dough to make pizza or a calzone. Or it could involve butchering pigeon, rabbit - even deer - to make tasty, nutritious meals. There are no ready-meals here. If you want something to eat, you have to source it and cook it from scratch. This is wild camping at it's best. Although, with the addition of a few luxuries some might describe this as wild glamping. Either way, it's an outdoors camping experience in the UK that will live long in the memory of those taking part.